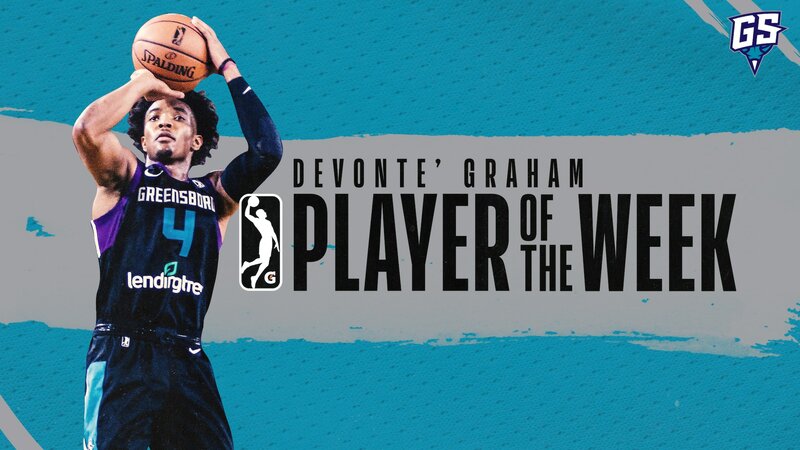 The NBA G League announced today that Devonte’ Graham was named NBA G League Player of the Week for games played Friday, November 2, through Sunday, November 12. Graham, who was with the Greensboro Swarm on assignment from the Charlotte Hornets, helped lead the Swarm to a 3-0 record to start the season. Graham averaged 28.3 points, 6.3 assists, 6.0 rebounds and 2.3 steals while shooting .500 from the field in three games with Greensboro. His tenure on the Swarm roster came through two assignments from the Hornets. Greensboro opened the 2018-19 season with a road-road back-to-back, where Graham had 16 points, nine assists and six rebounds at the Wisconsin Herd (November 2). He followed by leading a Swarm 12-point fourth-quarter comeback at the Capital City Go-Go (November 3). The Raleigh, North Carolina, native scored 18 of the Swarm’s last 20 points in a 31 point, seven rebound and six assist effort in the thrilling overtime victory. In Greensboro’s home opener, Graham had a 38-point outburst with five rebounds and four assists in front of a sold out Fieldhouse at the Greensboro Coliseum Complex. The University of Kansas product was big down the stretch, scoring eight of the final 12 points of the game to hold off the Grand Rapids Drive. Charlotte acquired the rights to Graham, the No. 34 overall selection in the 2018 NBA Draft, from the Atlanta Hawks in a draft night trade. Graham is the second player in organization history to earn player of the week honors. The first recipient, Xavier Munford, was an honoree on November 28, 2016.